Home » Blog » Real Estate Investing » I failed to grab my first real estate investment property… so what?! Just keep moving forward! Feeling frustrated when things don’t turn out the way they are supposed to? Do you feel like a total failure? You don’t have to, failing is totally different from being a failure, and failing is part of life, we just need to learn how to “Keep moving forward!”. This happened way back August 2007 after just 2 weeks of attending the weekly Cashflow group sessions at The Charter House in Makati. For those who have no idea what the Cashflow group was, it’s a weekly meeting of people who are interested in real estate investing as described in Larry Gamboa’s book “Think Rich Pinoy” (Page 142). Anyway, as an offshoot of attending those meetings, I was able to get a copy of BPI’s Buena Mano Green Tag listing and I highlighted promising properties on the list. When I showed the list to my mentor then (Dinna Revilla, who I contacted because Larry Gamboa said in his book that she was his mentor), she pointed out this one property in Makati that was probably worth looking into because of its good location. This was a condo unit at the BSA Mansions in Makati with a floor area of 34sqm. The intention was to make an offer to buy it for 2M. The day before (which was a Tuesday as the weekly cashflow group meetings are held Wednesdays), I called BPI to check if the unit was still available. They said yes and that I could visit the unit anytime. During the cashflow meeting, we decided to visit the unit on Saturday. Come Saturday, fellow Cashflow attendees Karen, Glenn, Earth and myself visited the property and found the unit as a great deal mainly because of the good location and relatively good condition of the property as it only needed minimal repairs. The numbers looked good as comparable condo units were selling at about 2.5M to 3.0M (take note that this was August 2007), meaning I could get at least P500,000 in gross profit if I flipped the property. If I were to go for a cashflow strategy, I could get at least Php6,000 monthly positive cashflow (Php6,000 would be the difference between the monthly rent and the monthly amortizations). I could even get more if I were to rent it out to an expat. Take note that this condo was just a stone’s throw away from Asian Institute of Management (AIM) and Greenbelt 3. Come Monday, I had a proposal ready and called BPI to check on the property. I was shocked to find out that the property was already sold last Friday, the day before we visited it. I guess it was a really good deal as the bank officer told me the buyer bought it in cash. Oh well, no need to feel bad as I am sure that there are other properties out there… I just have to keep finding those great deals. Great properties are sold quickly, and being able to decide quickly and take action is key. Had we inspected the property sooner, that might have been our first real estate investment. We had waited until Saturday when we knew about the property since Tuesday. What a difference a few days made! Of course, ready cash on hand for investment purposes would have helped as well! Do the numbers fast! Back then, I created a simple excel sheet to help me do this, I will share this here soon when I finish making it fool-proof. It’s all about location, location, location! I am constantly on the lookout for bargain properties in great locations. I am more confident that I will be making my money when I buy, not when I sell — meaning, I’m not doing any speculation as this is based on the present market value of comparable properties. I found out that this bank sold properties through mortgage loans, which meant I must be able to meet their financial requirements which are very stringent. Although I was confident on this, it would still take more time as compared to banks that sell properties through a contract-to-sell. Take note that the above article was written way back in 2007. Do you think my failure to acquire what could have been my first investment property made me lose interest in pursuing my goal of becoming a successful real estate investor? Of course not! If it had, you wouldn’t be reading this right now. Failures like this happened to me lots of times but persistence, patience, and passion helped me sustain my pursuit. If I remember correctly, similar failures happened to me at least 5 more times but I decided to suspend the disbelief and kept moving forward. 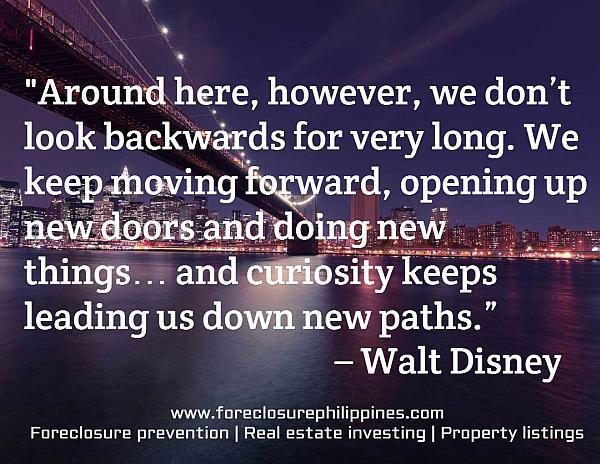 I got the “Keep moving forward!” attitude from the movie “Meet The Robinsons”. This movie is highly recommended for anyone who has experienced failing in life and you will understand once you have watched it. Trust me on this! My wife and I really believe in this. How many times have we heard of stories of successful people who had a failure that could have made them give up forever? What made the difference is how they carefully dissected their failure, learned from it, and moved forward. Many times, if successful persons hadn’t encountered failure (or failures), they would not have been forced to move forward. In short, failure can be a turning point in one’s life. It can either propel you to work harder in order to succeed, or bring you to the throes of depression. You have the power to choose which path to take. I remember that during those times two years ago, I would often hear people around me say that “real estate investing is hard”, “real estate investing needs big capital”, “you need to have connections”, “investing in real estate is risky”, etc. and all those things that beginning real estate investors hear from so called “well-meaning” people around us. I’m just glad I didn’t listen to all that crap! Text by Jay and Cherry Castillo.Copyright © 2009 All rights reserved. Previous PostAlways Check Service Entrances For Electricity And Water When Inspecting Foreclosed Properties!